Artist's rendering of waterfront portion of residential development planned for former Foxwoods site on South Philadelphia's Delaware River waterfront, between Tasker and Reed Streets. National Realty Investment Advisors, a Secaucus, N.J.-based development company that specializes in Philadelphia projects, plans a new enclave of rowhouses on part of the South Philadelphia Delaware River waterfront property where a Foxwoods casino was once proposed. NRIA's proposal calls for 169 four-story homes of around 3,100 square feet each with ground-floor space to park one or two cars, according to plans posted Wednesday to the website of Philadelphia's Civic Design Review board. A later phase for the 15-acre site would include 45 more houses on a pier attached to the site and a waterside public plaza at the end of an extended Dickinson Street, along with other public recreational spaces. The project would be built on the river-facing eastern half of the 21-acre South Columbus Boulevard property between Reed and Tasker Streets that was acquired by developer Bart Blatstein for $13 million in 2014 after its previous owners failed to obtain a license to operate a casino at the site. NRIA purchased the 15-acre section where the homes are proposed from Blatstein for $20.4 million in December, according to records filed with the city. Blatstein is said to be pursuing plans to build a large Wawa convenience store with gas pumps and a branch of Germany's Lidl supermarket chain on the Columbus Boulevard-facing section of the property, which he retained. Site plan for residential development planned for former Foxwoods site on South Philadelphia’s Delaware River waterfront, between Tasker and Reed Streets. NRIA's other projects include the townhouse developments near Front and Callowhill Streets in Northern Liberties and close to Sixth and Fitzwater Streets in Queen Village, according to its website. 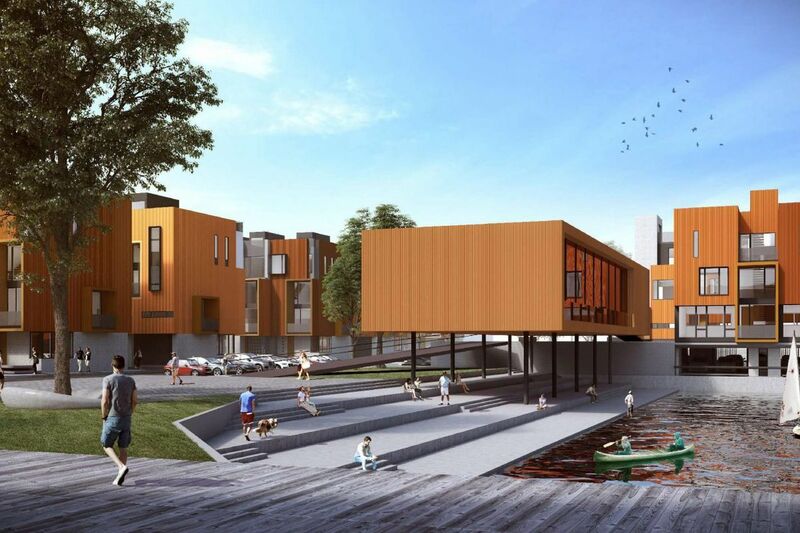 In addition to housing, its plans for the newly acquired waterfront site also include a 3,000-square-foot cafe near the river's bank, beside the waterfront strip where the nonprofit Delaware River Waterfront Corp. hopes to build part of a landscaped walking and cycling trail running from Fishtown to South Philadelphia. The stretch through the project site is the only section of what would be a 3.3-mile trail not under the control of the DRWC, which oversees development along central Philadelphia's Delaware River waterfront. The organization has a $861,500 state grant to acquire an easement for the trail along the site but must use it by the end of the year. NRIA founder Rey Grabato and DRWC president Joe Forkin did not respond to messages asking whether the trail easement had been discussed since the property changed hands. Negotiations on the trail with Blatstein during his ownership had been unsuccessful. Although the trail does not appear to be included in some diagrams accompanying the developer's submission on the Civic Design Review website, Shimi Zakin of the architecture firm Atrium Design Group, the project's designer, said in an interview that it is integral to NRIA's plans for the site. "It was one of our goals and the developer's goals to maintain the trail and make sure it's accessible to the public," Zakin said. Zakin said the project's initial 169-unit phase can be completed under the waterfront's zoning rules, but an exception from those guidelines would likely be needed for the pier-top development planned as a later stage. The Civic Design Review panel, which offers nonbinding suggestions on Philadelphia's biggest development proposals as part of the city's approval process, is scheduled to consider the proposal Feb. 6. Artist’s rendering of view looking east along extended Dickinson Street in the residential development planned for former Foxwoods site on South Philadelphia’s Delaware River waterfront, between Tasker and Reed Streets.